Sixty years of breeding work in New Zealand has resulted in a range of genetically improved tree stocks with improved traits such as growth, form, wood qualities and disease resistance. These tree stocks form the basis of control-pollinated tree breeding in New Zealand. 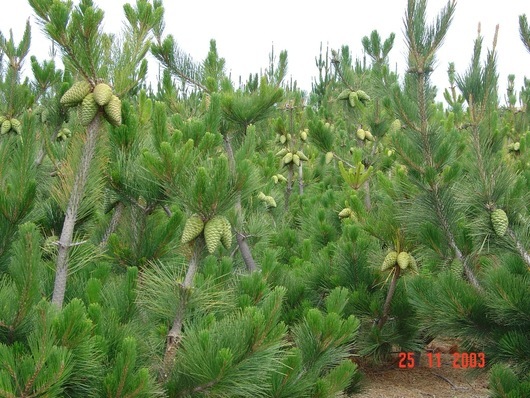 PF Olsen started the development of a control-pollinated pine seed orchard in Seddon in 1995 so we can provide planting stocks with the best genetics to our clients. 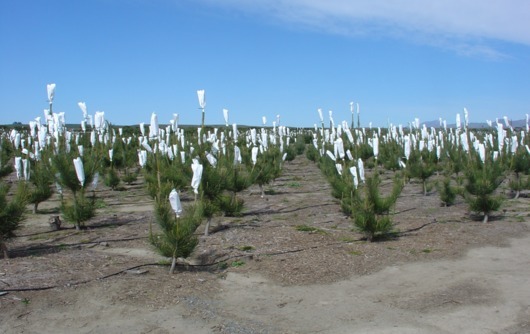 Radiata pine clones that ranked highest by the Radiata Pine Breeding Company (RPBC) were grafted and planted as mother trees in the 10 ha seed orchard. The RPBC GF Plus(R) scheme integrates breeding values on traits such as growth, straightness, branching habit, Dothistroma resistance, and wood density. Controlled pollination is done by bagging female flower cones in sealed bags and applying pollen from a known superior male parent so the genetic quality of both parents are known for the controlled cross. Flowering pine cones are bagged at PF Olsen's seed orchard ready for controlled pollination. Once pollinated, it takes 16 months for fertilisation to occur and another 5 months before the cones can be picked as green cones or 12 months to be picked as brown cones. Orchard trees are pruned vigorously to reduce tree height and promote the growth of cone-bearing side branches. Mother trees are kept in the orchard for 10 years or so before they are removed and replaced with newer and genetically more advanced clones. When mature the cones are harvested and the seeds are extracted and cleaned. Through this precise matching of parents with known superior traits, seedlots can be customised to meet specific forest needs in relation to site conditions and sought after traits or qualities. Such has been the market demand for CP seed, PF Olsen established a second CP seed orchard in Wairau Bar near Blenheim in 2008. Control-pollinated green cones growing in the PF Olsen seed orchard.